Vera&John Casino receives a largely positive review from us. While the good definitely outweighs the bad, it’s not the best online casino we’ve played; Mr Green currently has that title. Saying that, Vera&John Casino certainly has some excellent features that set it apart from the competition, and in a good way. As soon as you arrive on site, you’re greeted by the blue and pink colour scheme that reminds me of my 1980s’ Hypercolour T-shirt – that was once my favourite t-shirt, so I rather like the colour scheme. You might find it garish. 10x for Stickers – this was a fun game and a good introduction to the site. 10x for Sparks – another fun game, made all the more fun by my £2.24 win! One of the first things I noticed about the site is the “player’s room”. This is a graphic animation that looks like a room. You can personalise it with your favourite games, so that when you log into the site, or return to the homepage from elsewhere, you can find all your favourite games. The original room was full of cats, so I changed my room to the “Sophistication” theme – they didn’t have a dog room! You might be wondering why I bothered, given that I’m an adult…well, it was the lure of rewards. This site is renowned for its rewards, and rightly so. Changing the theme bagged me some coins to spend in the shop (more on this in the “Rewards” section of the review). The room idea might sound silly, but it’s actually hugely useful. I found it much easier to navigate the site, because I just placed my favourites in the room, rather than having to search for the various games each time. Another nice feature is your personal account page which doesn’t just have your address details etc but a whole raft of personalised information about your gaming such as various achievements and graphics outlining your highest wins as well as your current rank in the casino out of nine, from lowly cocktail waiter up to Casino Manager. • Progressive Jackpots: if you’ve read any of my other reviews, you already know that the PJs are my favourite games. It’s the big bucks that draw me in and Vera&John Casino certainly has that, with its fantastic mix of high, medium, and low jackpots. You’ll find all the big names, Hall of Gods, Mega Moolah, and Mega Fortune, but also some fantastic mid and low weight games, such as Bell of Fortune, Wow!Pot, and Cosmic Fortune. Together, they offer you the chance of winning JPs from £2000 up to £7,000,000, and everything in between. They have a good selection of JPs. From the 24 that they offer –quite high for an online casino – you’re sure to find one that takes your fancy. One thing that I particularly liked is the way they show the JP amount below each thumbnail. This means you can easily see which game is offering the highest (or lowest, because some people feel they’re more likely to win with the lower JPs) winnings at any particular moment. Another thing they do, and this isn’t limited to the JPs or slots, is to have a little speech bubble above a game that either has “$”, a “Hot”, or “New” written inside. 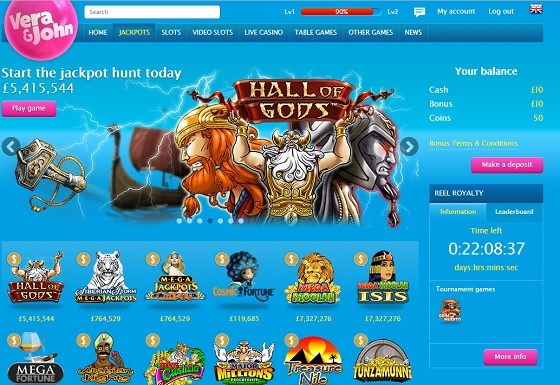 The Hot games appear to be the games that are paying out the most at present, because when I played on Mega Jackpots Isle of Plenty, listed as “hot”, it paid out £44 from a £1 bet – not bad! • Video Slots: I’m sure they offer one of the biggest variety of slots that I’ve seen at any online casino. I counted 459, so if you can’t find one to play from that, then you simply can’t like the slots. As you can appreciate, the video slot section offers a fantastic selection of games, ranging from the old-school fruit machine games (and there are quite a few of these, if you like them) to the ultra-modern games, like “Dragon’s Temple”. You’ll find slots to suit all budgets. If you only have a few pence left to play, then you can. If you have £100+ you want to spend on a single spin, then that’s possible too. NetEnt’s “Casino Cosmopolitan”: smaller than Casino Cosmopolitan, it only offers 8 games, all of which are either Blackjack or Roulette. The graphics are OK, but some of the games loaded badly on my desktop computer. High rollers will love Casino Cosmopolitan. You can make bets of up to £75,000, which is incredible! Evolution Gaming’s “Casino Paris”: personally, I found this to be the better of the two casino. It offered far more games. There were 7 roulette games, 30 Blackjack games, 3 Baccarat games, 1 Texas Hold’Em, and 1 Three-Card Poker. The graphics were much better, and they give you a choice of viewing angles and various added extras, such as choosing the 3D version. Both casinos have a minimum bet requirement of £1. • Table Games: the table games are pretty fabulous. Vera&John Casino offers all the usual suspects – Baccarat, Poker, Blackjack, and Roulette. In total, they offer 78 different table games. Amongst their table games, they offer some fantastic games that you don’t often see at other online casinos. Once such game is Pontoon, a variation of Blackjack. I used to play it a lot when I was younger – picture an 8 year old in the ‘80s wearing a Hypercolour t-shirt and playing Pontoon for Blackjacks (the sweets) and you’ll have me all figured out! Playing Pontoon was particularly fun for me. Other interesting games include 3-wheel roulette, Red Dog poker, Oasis poker, and even 10-play draw poker, and Monopoly Roulette, which is one I haven’t seen before, but great fun. • Other Games: this was quite an interesting area of the site. They offer three games in their “Other Games” section, and they’re quite unusual. For instance, “Leapin’ Leprechauns” involves you using your leprechaun avatar to jump from cloud to cloud, collecting things like horseshoes and four leafed clovers. It has the feel of a platform game with the bonus of being able to win money. Vera&John Casino is well known for its substantial reward and bonus structure, and rightly so; they are surprisingly generous. • Loyalty Programme: the first thing to note is their loyalty programme. Here, you receive rewards as you make your way around the site and play games. These rewards are in the form of coins, which you then spend in their shop. You can earn coins for all sorts of things: when you first deposit, when you change your screen name (first time only), when you play a single game for a particular duration, and so on. You can find details on their site. The type of things that your coins can buy include £2 worth of spins on particular slots, £10 to spend on roulette, etc. As you stay and play on the site, you move through the levels of the loyalty programme, and more and more offers are open for you to purchase. • Bonus structure: Vera & John Casino offer a generous bonus structure, including a first deposit 100% match bonus t&c apply. 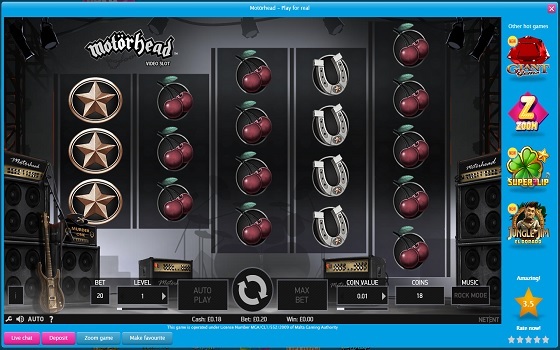 As well as deposit bonuses, they also offer free spins, spin credits, and various other types of promotion; for instance, they currently have some Rod Steward tickets to give away and there are regular themed tournaments throughout the month. The best thing about their bonuses, in my opinion, is that they have separate running tallies. You can see how much of your play money comprises of real cash and how much comprises of your bonus. This makes it much easier to work out when you can make a withdrawal. Just go to your account and see whether you have any real cash to take out, or if it’s all still part of a deposit. This helps you to avoid that age-old online casino problem of trying to work out at which point you can withdraw winnings won via a bonus. The first thing we should note is that the play experience varies between the mobile app/site and the desktop site. The video slots are better on the mobile/tablet (at least when using Android). This isn’t because they get it wrong with the desktop version, but rather because they get it so right with the mobile version. The games load better, the graphics look more attractive, and plenty of them, such as Hugo, take you on cool little adventures that don’t happen on the desktop versions. It’s harder to navigate the site on mobile simply because they don’t have a search function on the front page, and so you have to scroll through the 100s of video slots before you find the one you’re looking for. Or, you can do as I did and use the search function on your browser to look for the particular game. Although they don’t have the search function, they do provide some navigation options. 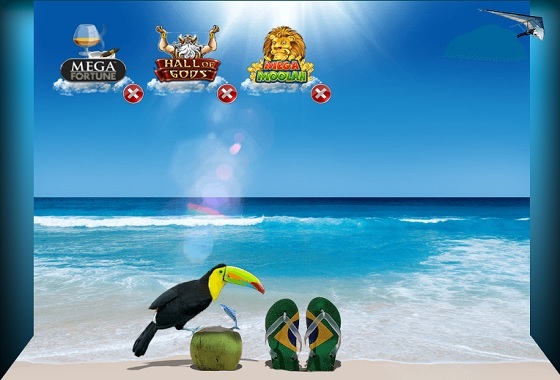 You can choose which area of the site you want to visit, “All Games”, “My Favourites”, “VJ’s Favourites”, “Slots”, etc. The desktop version offers a greater range of games. The live casino section is entirely missing from the mobile version, and that is a shame, because this area of the site offers a great selection of games. 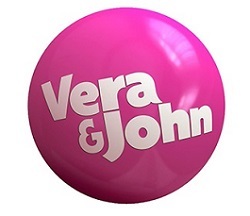 However, this isn’t anything unique to Vera&John, but a fact of mobile gaming technology, which lags behind desktop gaming technologies in terms of sophistication. The live casinos are just too advanced to play correctly on mobile platforms. If you love playing the video slots and progressive jackpots, then you’ll probably prefer the mobile version – although, the desktop version still offers all of the games. If you prefer live games, then you’ll the desktop site is the best option. 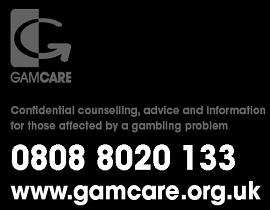 I had a query when I first joined the casino (I wasn’t sure whether I had 10 or 20 free spins) and had to get in touch. It was incredibly frustrating. Initially, I tried the Live Chat option. It held me in a queue for three minutes – with an intermittent “Your request is important to us…” notification – and then said there was no one available and to email them. The email pop up screen activated, but it had no send button. I gave the Live Chat option another chance, and this time it worked. However, they were very slow and it took 15 minutes for them to answer a simple question. Overall, it took about 20 minutes to sort the whole thing out, and I wasn’t very impressed. This happened at the very beginning of my journey with Vera&John Casino, and so it set a bad precedent in my mind, and gave me a somewhat harsh view of the site than I otherwise would have. Still, a decent Live Chat is a huge bonus for me when it comes to playing the online casinos. The only thing that managed to prevent me keeling over in abject boredom was the fact that I could play and wait for the chat at the same time. I just had to split my screen. 1. As with most online casinos, they have a relatively strong gambling awareness sentiment. There are regular prods and pokes to make sure you consider whether or not you’ve been playing too long. One thing I did find funny was receiving a loyalty award for playing 100 spins of the same game, which isn’t the best way to encourage safe gambling! Still, they’re a casino and we’re adults (I hope), so they can only address the issue so much. 2. The video slot games look relatively small on a desktop because they’re clearly intended for mobile. However, if you hit the “zoom game” button, it works much better. Overall, a mixed review for Vera&John Casino. I did like a lot of things about the site, but there were a few things (especially the Live Chat) where they lost brownie points. Still, I would definitely recommend them for their fantastic choice of games. Definitely worth a go if you’re looking for a new casino.